A total of 28 seats are up for grabs when electors in Melton go to the polls on May 7 and vying for your vote will be 28 Conservative, nine Labour, five Independent, five UKIP and two sole Independent candidates. Today candidates fighting for seats in the town wards have their say. Sacha Barnes (UKIP) I have been a resident of this historic town for over 30 years and have consequently always taken an interest in local affairs, issues and progress. I run a removals and haulage company and have been involved in this industry for about 14 years. I decided to become more proactively involved in politics and support UKIP due to the fact that this great nation needs to get back on track and support common sense. The constant juggling between Labour and Conservatives throughout our generations is getting us nowhere, trapping our nation in a vicious circle of endless nagging and bickering without really offering any sense of progress or hope. We are here to listen to you, not to dictate! Our country’s future starts at home. people from all works of life. I live and work in Melton having moved here three years ago and during this time I have worked as a volunteer for a local charity mentoring young people who are struggling with varying life challenges. Melton has now become my home and a place for me to find good friends and a warm community that has made me feel very welcome. I have enjoyed meeting the residents of Craven Ward who want to be represented positively on the council. I will keep residents informed and stand up for you ensuring that your voice is heard. Gary Bush (Sole Ind) “I’ve thoroughly enjoyed my time as a councillor and with so much more work to do for both the town and Craven Ward I’d be delighted to serve for four more years if elected. “I’ve met, helped and advised many people during this time, something I find very challenging and rewarding especially when a satisfactory solution to a problem is found. “I think one of the primary things as a councillor is to listen to what people have to say, help and advise them accordingly with any points they may raise and to support them when problems occur. Jeanne Douglas (Con) As the current elected Conservative councillor of Craven Ward, I gained invaluable experience and will continue to serve you well should I be re-elected. I always strive to consider the needs of the residents of this ward most carefully in all decisions that I have voted on at the council. As a teacher of vocational education I look to support employment opportunities and helping families through their own issues such as practical childcare needs while jobs are being sought. I am very keen to promote affordable housing and to be most sensitive when dealing with planning concerns. I am a governor at Birch Wood School and some may recall the work club that I voluntarily ran a few years ago in the library. Others may be aware that I also run a hobby business - in astrology - in the locality. David Odgen (Lab) “I’ve lived on Meadow Way in Craven Ward for the last 12 years. “After retiring from the Highways Agency last year, I joined the committee of the South Melton Residents’ Association in order to represent the interests of local people. I’m presently helping residents to secure funding for new play equipment in our park. “If elected I will consult residents and Melton In Bloom on further ideas for the park – to make it an even more attractive facility. “I live in Craven Ward so I share the frustration of trying to access Burton Road during peak periods. And once you do actually get into town, there’s total gridlock, due the lack of a bypass for Melton. Pat Cumbers (Con) “I have represented this ward since 1997. I am retired but my working life included banking, accountancy and insurance. I have held a number of positions of responsibility at the council and currently chair the licensing and regulatory committee. For many years I have been active in the voluntary sector and am a Shopmobility trustee. I also chair Melton Seniors’ Forum which includes older residents and a number of organisations, all working together to improve life for older people and helping them to stay active mentally and physically and enjoy their retirement. Marilyn Gordon (Sole Ind) I’m a true Meltonian, born and bred, and was a local ward councillor for Dorian Ward between 1999 and 2003, again in 2011 to the present time, and was the Mayor of the Borough of Melton between May 2013 and May 2014. In addition I’m also a born-again Christian. As a councillor I’ve been active in dealing with issues raised by residents of this ward and an active member of various council committees dealing with issues concerning Melton and the borough. My main aims are to: Alleviate the car parking issues around Blyth Avenue during school start and finish times; AstroTurf the multi­-use games area at Kirby Fields Park, fit basketball hoops plus netting to cover the top; Implement traffic calming measures where needed (but not speed bumps) and install grit bins in specific places within the ward, where needed. John Moulding (Lab) has lived in Melton and specifically Dorian Ward for most of his life. He currently runs his own successful business. He’s been the Labour councillor for Dorian Ward for the last four years. If elected John will work to improve Melton’s economy by urging the council to do more to attract more highly paid jobs to the town. Melton can only do this if it grows. There’s an urgent need for more housing in the borough, with many young people locked out of owning their home. But these homes can only be built once the traffic situation is resolved. Melton desperately needs a bypass. This has been promised by the ruling Conservative councillors but time and again they’ve failed to deliver. John will work to ensure a bypass is built - to create opportunity within the borough and avoid economic stagnation - because Melton deserves better. Jan Overfield-Shaw (Lab) lives in Melton, around the corner from her daughter and young family. Jan works with homeless and low income families in Nottingham. She’s also worked in local authority planning departments as a masterplan co-ordinator. Alan Pearson (Con) is a Dorian resident and has lived in Melton Mowbray now for over 20 years. He is currently the county councillor for South Melton and is actively involved in many local committees and groups including: Friends of Gretton Court, Sure Starts, Family Voices and Latham House’s Parents’ Reference Group. Also he is Governor of Sherard School, West Gate Special School in Leicester and Leicester College. Alan has been the chair of Active Melton now for over 10 years and has been one of the driving forces behind the future development of a sports village on the King Edward VII School site. He owns a business which he runs from Asfordby Business Park. Alan has played international representative rugby and is passionate about all sport and physical activity, partially for children and the older population. He lives, works and socialises in Melton. Stuart Rolley (Lab) is a senior manager at the Environment Agency, working across the Midlands to protect households and businesses from the effects of flooding. He said: “I’ve lived in the Melton area for 13 years with my wife, who is an NHS consultant psychologist, and my two daughters. This is my first venture into the world of local politics. “I believe in strong public services as the basis for a fairer society. Access to high quality and reliable services is an important part of everybody’s lives. “I’m also passionate about protecting the environment and think we all have a duty to leave the world in a better place than we found it. “If elected I will work to ensure that all the people of Melton are fully represented in the decisions of the council. They deserve better. John Wyatt (Con) has lived in Melton for the last 29 years and been a Melton borough councillor for eight years. He is a retired professionally-qualified mechanical engineer. He said: “I now wish to stand in Dorian Ward which is where I live. I serve on the policy and finance committee and the licensing committee. This year I have the honour of being Mayor of the Borough. “I always put my council duties first as I enjoy the commitment that goes with the success of the council. Michael Blase (Lab) is a 59-year-old family man and design engineer who works as a project manager for Babcock International. Michael is a keen gardener. Indeed his passion and commitment to helping others is matched only by his love of his garden and allotment. Michael believes that as a nation we should be judged by the quality of life of our poorest citizens - over recent years they have been the very ones who have suffered most from austerity and cuts to local council services. Mike Brown (Lab) Originally from Leicester, Mike Brown worked in local government housing and finance before joining the staff of UNISON (then NALGO) in 1979. After periods spent in other parts of the country he returned to work in the East Midlands and settled with his family in Melton 13 years ago. Mike is particularly concerned that too many jobs in Melton are low paid, often minimum wage or zero hours contracts. This means that hardworking families struggle to make ends meet, and our young people too often leave to find work elsewhere. The future of the town depends on attracting businesses offering better paid work. Mike wants to see the council doing more to achieve this, including acting to deal with the transport infrastructure and campaigning to finally get the much needed bypass. Tina Culley (Ind) “I want to become Egerton Ward’s local Independent councillor to continue and extend my involvement with residents I already help and support through R.A.G.E. “Born, raised, educated, working and living in Melton - I’m a proud Meltonian living in Egerton Ward for the last 19 years. For many years I’ve been a committee member, vice chair and lastly chair of the highly successful and respected resident’s group R.A.G.E. – Resident’s Action Group – Egerton. I’ve also been part of the 4th Melton Mowbray Scout Group for the last 32 years, mostly as a warranted leader. “If elected I’d work within the council and my community to continue tackling anti-social behaviour, graffiti, fly tipping and poor parking particularly on Tuesdays while supporting R.A.G.E. and residents at local meetings and surgeries. Peter Faulkner (Con) has lived in the borough for most of his life and works for Elaine’s Taxis. Peter has always had an interest in youth development having been involved in the local Scouting movement for many years as a cub leader, Group Scout leader, a member of the district executive and chairman of the Scout Fellowship. He also served as a parent governor at John Ferneley College for seven years. Peter spent many years on the local football scene as a referee officiating at all levels from junior football to the Leicestershire Senior league. If elected to serve on the council, youth services would be a priority. Peter’s other political interests are licensing, planning and housing and he would like the opportunity to be the voice of the Egerton Ward on the council to ensure the continued improvement of housing and services within the ward. Madeleine Smith (Con) was born in Sunderland. She started her nursing career at Harlow Wood Orthopaedic Hospital (Notts) with combined training at Leicester Royal Infirmary (LRI) - successfully becoming a state registered nurse with an Orthopaedic Nursing Diploma. She said: “I was a senior sister at the LRI in emergency and general theatres. Following a break for my family I returned to nursing as an occupational health nurse at Mars (Pedigree Petfoods) and then an occupational health adviser at the University Hospitals of Leicester, looking after the staff and their commercial business contracts. I retired in 2012. “I’m married and have three grown-up sons and three grandchildren. “I’m involved in many aspects within the community. I’m a very active member of the Melton Lions and a trustee of Melton Mencap. Margaret Glancy (Con) On returning to UK from overseas with the RAF we settled in Melton Mowbray in 1980. We considered the area had good schools, facilities and offered a safe and friendly environment. I have a background in finance and administration, a legal cashier then school bursar. I’m a Thorpe Park Residents Committee member, a Friend of the Country Park and an original committee member of Melton North Action Group who challenged the withdrawn Core Strategy. I’m keen to bring a fresh perspective as a councillor, challenging conventional thinking and promoting clarity in all that the council does. This is an important period. We need a bypass but we also need infrastructure to support existing and future developments plus the right housing mix for new and existing residents. Simon Lumley (Con) I’ve been a Melton borough councillor, serving Newport Ward, for the past four years and during that time I’ve worked very hard both in the ward and the borough to make a difference. For example, my fellow ward councillor, Pam Posnett, and I worked together to launch the successful Armed Forces Community Covenant. I’ve worked with my wider Conservative councillors to achieve the best for Melton such as council financial stability, for a better local economy, better local services, greater prosperity and helping the weak and vulnerable. I’ve also been very proactive in trying to achieve our key priorities and pledges from our 2011 local election manifesto, including holding monthly councillors’ surgeries. I’m a member of the County Highways Committee highlighting local issues. If elected I’ll do my utmost to continue this hard work. It would be a pleasure to again be your ward councillor. David Overfield Shaw (Con) is 51 and lives and works in Melton. David teaches at a Melton school and believes passionately in providing outstanding opportunities for all children and young people. David has for many years campaigned to protect our public services and has fought for a decent living wage for all. He believes Melton Council should provide apprenticeships for local young people. He said: “Melton needs homes - including ‘affordable homes’ and homes for elderly people - but these should be built across the whole borough - not just in the north of the town. Pam Posnett (Con) I was first elected in May 2003. I believe my role as a councillor is to represent the views of residents but also look at the wider development of the borough. I am working with officers to replace the sports pavilion in the country park. My aim to have a sports village for the borough is at the first phase and I look forward to working with residents to develop this. I continue to work with young people in helping them to realise their ambitions. I’m a governor at Brownlow School, John Ferneley College and Brooksby Melton College. Councillor Lumley and I hold monthly town councillors’ surgeries in the Market Place. We have a strong track record of supporting local residents in proposed developments. I’ve lived in the borough for 42 years and I was employed as a nurse by Mars UK, formally Pedigree Petfoods. John Scutter (UKIP) The major issue facing Melton borough is the Melton Local Plan which will address where at least 5,000 new homes (a massive increase of 25 per cent) will be built along with the necessary infrastructure in terms of roads and schools to support them. It will also address how to attract places of work for these extra households. If these workplaces do not already exist or are not already planned then I don’t see why such a massive increase in the number of households is necessary and I’m sure that this is not sustainable development. The ‘Draft Local Plan, Preferred Options’ is due to be published this summer. If elected I would not be obliged to follow a party line on the plan and would be free to fully represent the views and interests of the residents of Newport Ward. On May 7 think about Melton Newport and Vote UKIP. Tejpal Bains (Con) was born in Walsall in August 1989 and moved to Melton when he was four-years-old. He was educated in Melton and Grantham and then spent three years at the University of Leicester studying politics, gaining a BA Honours degree. Tejpal then spent a further two years studying law as a postgraduate at the University of Birmingham and Nottingham Law School respectively gaining a graduate Bachelor of Laws Degree (LLB). He now works at a Latham & Co in the town. Tejpal joined the Conservative Party in November 2012 and immediately expressed his desire to run for the local council elections in 2014. Tejpal aims to promote politics to the youth of today and hopes to be a strong voice for Sysonby residents on the council. John Illingworth (Con) It has been a privilege to be part of the Sysonby Ward team on Melton Borough Council for the last eight years. During all of that time I’ve served on the planning committee and am acutely aware of how much our decisions can impact on residents. I believe I’ve shown a willingness to speak up, not only against things which I believe are wrong but more importantly against things which YOU believe are wrong. Planning and shaping the town and borough of Melton is a great challenge. I’m pleased to be involved in the production of the new Local Plan, as a member of the Local Plan Working Group and chairman of the Landowners & Developers Reference Group. I very much want to continue representing the residents of Sysonby Ward and would be very grateful to enjoy your continued support to do so. Vanessa Jackson (Lab) was educated in Melton and lives in the north of the town. Vanessa believes in fairness and wants to be a voice for residents who feel ignored by the council. Vanessa has actively campaigned to secure the future of Fairmead Sure Start Children’s Centre in Drummond Walk. In their spare time Vanessa and her husband love to run the Melton Community Allotment at the Country Park. Val Manderson (Con) It’s been a privilege to serve the residents of the Sysonby Ward for the last four years and by far the most rewarding and satisfying part of the role has been helping to sort out individual problems and issues. We must continue to balance our budget so that we can provide essential services to effectively care for the most vulnerable and elderly in our community. We must also continue to support local businesses so that, together with our partner agencies, we can make sure the borough of Melton is a safe, welcoming, successful and pleasant place to visit, work and live in. I also feel very strongly that we must plan very carefully for the future expansion of the borough making sure the necessary infrastructure is in place to support housing needs. If elected, I will continue to do my best to help and support you. Mark Twittey (Ind) I’m 41-years-old and a born-and-bred Meltonian. I’ve been an INDEPENDENT Melton borough councillor since winning a by-election in 2012 and I’m standing for re-election to the council in Sysonby Ward, where I’ve lived for over 10 years on Clark Drive. My wife Maria and I have three children aged 14, 11 and 8 and I’m passionate about improving our town for current and future generations. Suzannah Blase (Lab) has lived in Melton all her life and was educated in local schools. She works as a chef manager for a local company. She said: “Warwick residents know all about the consequences of years of Conservative inaction about traffic. We urgently need a bypass to stop cars using our local streets as a rat-run. 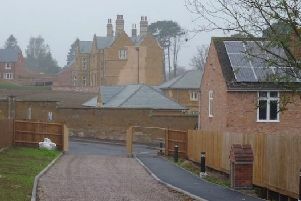 “The ruling Conservatives have left the south of Melton besieged by speculative housing developers. Of course we need more homes. I support small developments built across the whole borough but we can’t add more homes to Warwick Ward until a proper bypass has been built. The answer is simple. An Independent is not tied to a political party. They can ask the council to answer difficult questions, challenge decisions and ensure value for money. They work purely for the people who vote for them. I’ve lived in Melton for 23 years and I’m a mother, wife, full-time tutor and residents’ association member. As a councillor I’ve dedicated eight years to understanding the workings of a council, fighting to get local issues discussed and resolved. “Vote for me on May 7. I’ll continue to fight for support to local businesses; for schemes to attract new businesses that will boost or sustain our town and rural economy; for assisted independent living and 24-hour care; for family and youth activities; for new, affordable houses - in the right locations - and for new road systems. Tom Greenow (Con) was born in Hereford in February 1990 and moved to Melton in July 2014. He has a degree in land management, obtained from the Royal Agricultural College. Tom has worked as a livestock auctioneer, which was his ambition. He joined Melton Mowbray Market as a sheep auctioneer last year and can be seen selling every Tuesday, on market day. In the short period since moving here, Tom has fallen for the area and is a real fan of all Melton Mowbray has to offer as a town. Tom believes it’s important that residents are kept informed on what their council does for them and how they can become involved. Tom hopes that by standing in local council elections it will show youth in the area that involvement does matter in decision making in the local council and that their input will make a difference. Julia Hurrell (Con) A recently retired headteacher, our family have resided in the Melton area for nearly 20 years and we’re all committed to making Melton a better place for all. Married with three sons, two daughters and eight grandchildren, our family has enjoyed a history of success in the areas of business, education and the sporting arena. I want all our children and young people to enter the workplace at the end of their schooling and training with the best possible qualifications. I’m keen to ensure employment opportunities and economic development are facilitated to provide greater local growth in business and trade to support the people of Melton. Alongside this is the issue of transport and accessibility in and through Melton. I want to make a real difference to the people of Warwick and Melton and contribute to the decisions needed to be made in the future. Duncan Shelley (UKIP) is ex-military and an electrical and mechanical engineer by trade. He said: “I’m deeply involved in the local community especially with Shout4Residents and Asfordby FC. “As a local man I hear and see what is going on first-hand. “Melton faces major changes over the next few years. If not managed correctly, these will be very damaging for all of us. “I understand the need for more housing but our infrastructure can hardly cope with the current size of Melton without adding over 1,500 houses with token infrastructure improvements! This is just one major issue that needs addressing. “UKIP councillors do not have to follow any party line and strongly believe in openness and transparency in the council chamber combined with common-sense strategies.